My first encounter with wine was during Hotel and Tourism school 1987 – 1988. After school I was working as a waiter and I was always ‘’in love with wine’’ . My first Sommelier job I got on Cruise ship Crystal Harmony, who was the most luxurious cruise ship on seven seas. My first Mentor and Head Sommelier was a Danish guy Jan Sorensen. 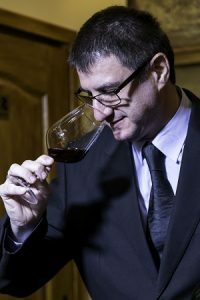 Professional Sommelier must have professional manners: knowledge, passion, positive attitude, excellent salesman and wine-tasting senses and of course to know how to listen. I had practice with many Master Sommeliers during ‘’Food & wine festival’’. The most important is that in the beginning working in the team with experienced Sommeliers with a lot of studying and practicing. This is very important thing. First, Sommelier should listen guest very carefully and building positive relationship with your guest. Listen their taste and giving them two – three solutions. Always asking leading questions to get short answer from the guest. Always congratulate to the guest for great choice. I’m not dying for especially expensive and famous glasses. I always prefer a perfect match between glass and wine, including food & water. Wine should follow the food order, but sometime ( in last few years very often ) guests are coming to the restaurant for wine experience as a first . Always listen a guests and if they like a wine which has not match the food dish, Sommelier job is to present and serve wine with pleasure. Guest should drink what they want, that is only rule. Only if the guest are not sure or if they ask Sommelier to taste. Many restaurant has that as a service rule and probably in future will be a standard in all restaurants. The Wine list is image of the restaurant. It is a balance between the types of restaurants and guest structures we create. Each Wine list represent individual ‘’Terroir’’ of the restaurant. Professional wine list should have all stiles of wine and of course wines with different prices. Guests must to have solutions. In Wine list always must be a wines important for region. Of course, Wine list must have expensive wines too ! To sell popular and prestige wine is nothing magic for good Sommelier, guests choose them by themselves. Wine is live product. Sommeliers and wines are growing together, if we give ourselves to the wine, wine will show itself everything we expect. Changes are good, that’s why we have the best job on the World. I like to taste a new wine. I’m traveling a lot and to share a new experience with colleagues is always a pleasure. I always listed a wine who is my ‘’Terroir’’ need.